Our Anschütz Laser Power III Biathlon Set inlcudes everything you need for a Biathlon competition on cross skates or rollerskis. It is only convenient for shooting into the included target system. The rifle shoots a laser beam and the Biathlon target system detects if the specific target was hit or if the shot missed. This will be optically displayed in the targetbox. 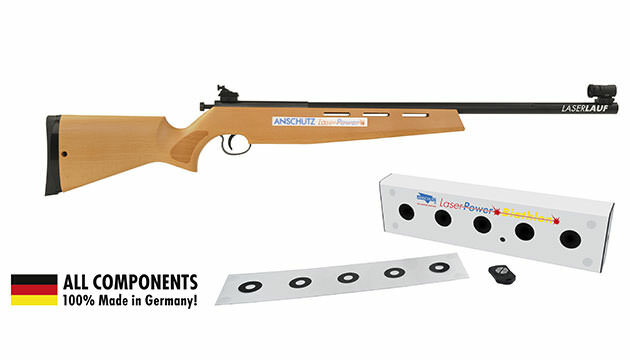 The Anschütz Biathlon set is made for a distance of 10m. The Anschütz PowerLaser system has been upgraded a few times in the past years. Particularly the targetbox has been improved. At X-Skating you will always receive the latest version.